(Oklahoma City Chamber of Commerce Collection, OHS). Oklahomans observed their twenty-fifth anniversary of statehood fairly quietly because of the Great Depression but put on a major celebration for their fiftieth anniversary. Events recognizing the Silver Jubilee of statehood had been limited to the week around November 16. On November 16, 1932, a reenactment of the mock wedding ceremony, similar to the one held in Guthrie on November 16, 1907, was held on the steps of the Oklahoma Historical Society building in Oklahoma City. The all-day celebration began with a parade led by Gov. William "Alfalfa Bill" Murray through downtown Oklahoma City and ended with a banquet and dance held that evening. Tulsans celebrated with a parade, a square dance and fiddlers contest, and a formal dinner and ball. In 1957 Oklahomans commemorated fifty years of statehood with events scheduled between April 22 and November 16, 1957. These dates were chosen because the first land run in present Oklahoma had occurred on April 22, 1889, and statehood had taken place on November 16, 1907. In 1955 Gov. Raymond Gary appointed Lou S. Allard of Drumright and a member of the Oklahoma House of Representatives as chair of the Oklahoma Semi-Centennial Commission, established by House Joint Resolution Number 511 of the Oklahoma Legislature in May 1953. The state was divided into twelve regions, each with an individual responsible for directing the county committees within the region. The committees coordinated local events that included rodeos, parades, festivals, pioneer days, and Indian ceremonial dances. 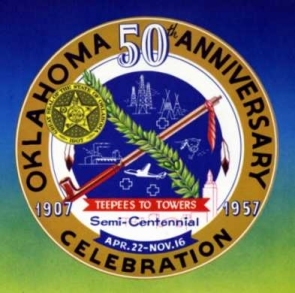 As the primary goal of the celebration was to attract visitors to Oklahoma, slogans included "Visit Oklahoma First" as well as "Arrows to Atoms" and "From Tepees to Towers." On April 22, 1957, statewide events were inaugurated in Guthrie with a parade. 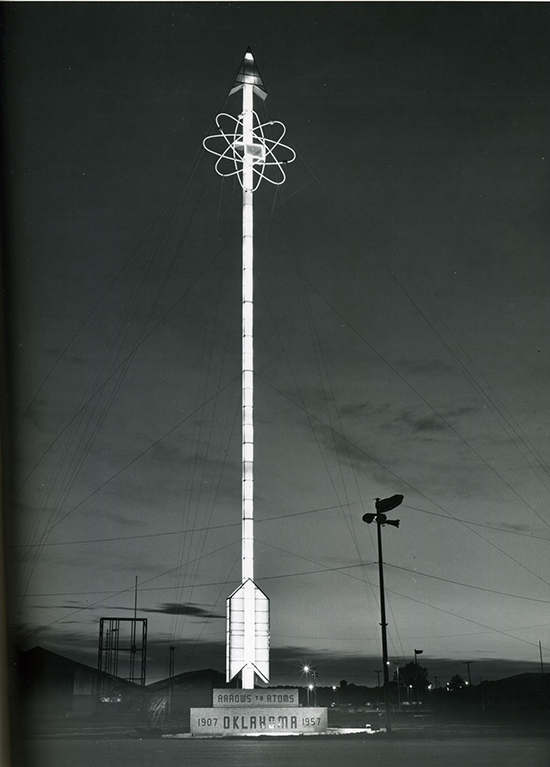 The "Arrows to Atoms" two-hundred-foot-tall tower at the state fairgrounds was dedicated and lighted on that day. Actor Joel McCrea, who starred in the movie The Oklahoman (1957), participated in the Guthrie parade and joined the lighting ceremony at the state fairgrounds. In addition, a Semi-Centennial History and Art Exhibition at the Gilcrease Museum in Tulsa opened on April 22. The major commemorative project was the Semi-Centennial Exposition. Between June 14 and July 7, 1957, the state fairgrounds in Oklahoma City stayed open twenty-four hours a day for visitors to attend the exposition. Admission was ninety cents for adults and fifty cents for children twelve years old and younger. Oklahoma oil companies sponsored the building of a two-block replica of an early Oklahoma oil-boom town. The Boom Town had a general store, blacksmith shop, newspaper, boarding house, chili parlor, lumberyard, and several wooden oil derricks. Inside the "House That Oil Built" was an exhibit explaining the petroleum industry. In addition to the Boom Town, there was a Teen Town, an international exhibit, science and industrial displays, and a women's fashion center. The International House had displays from the Soviet Union, India, Japan, Korea, Belgium, Venezuela, Italy, and Israel. Nationally known performers such as the Ziegfeld Follies, Mickey Rooney, the McGuire Sisters, and Patti Page appeared, and the National Folkdance Festival participants also performed. More than a thousand American Indians attended a powwow highlighted by a buffalo barbecue, games, and sports. During the exposition, television and radio programs originated from the fairgrounds, including NBC's Today show with commentator Dave Garroway. The governor, the Oklahoma City mayor, and the Oklahoma City Chamber of Commerce director wrote letters to their future counterparts and placed them in a time capsule to be opened during Oklahoma's centennial celebration in 2007. The letters and other items were placed in a stainless steel capsule, which was buried at the south end of Boom Town at the state fairgrounds on July 7, 1957. On August 14, 2006, the capsule was unearthed, and its contents, including newspaper clippings, photographs, letters, and souvenirs will be displayed at the Oklahoma History Center in Oklahoma City. A variety of items and events underscored the festivities. The U.S. Postal Service issued a three-cent, commemorative postage stamp in June 1957. In Washington, D.C., the Library of Congress exhibition Oklahoma: The Semi-Centennial of Statehood, 1907–1957 was open from November 13, 1957, to February 15, 1958. Sculptor Laura Gardin Fraser designed a commemorative bronze medallion. Allan Clark of WKY radio wrote a new song, "I'll See You in Oklahoma," released on April 15, 1957. The Oklahoma Almanac Golden Anniversary Edition was published that year, and the Oklahoma Today magazine produced a forty-page souvenir edition. Approximately fifteen thousand Oklahoma junior and senior high school students entered the statewide "Onward Oklahoma" essay contest sponsored by the Jaycees and the Semi-Centennial Commission. The nationally televised football game between the University of Oklahoma (OU) Sooners and the Notre Dame Fighting Irish in Owen Stadium in Norman, Oklahoma, on November 16, 1957, marked the close of the semicentennial activities. Gov. Gary declared that day as "University of Oklahoma Day." However, OU's homecoming and the statewide commemoration were dampened by OU's 7–0 loss. Daily Oklahoman (Oklahoma City), 13, 16, and 17 November 1932. Golden Jubilee Essay Collection, Research Division, Oklahoma Historical Society, Oklahoma City. Bill Mullins, "An Exercise in Pride: Celebrating the Oklahoma Semi-centennial," The Chronicles of Oklahoma 85 (Summer 2007). "Oklahoma Semi-Centennial Exposition," Vertical File, Research Division, Oklahoma Historical Society, Oklahoma City. Oklahoma Semi-Centennial Exposition Photograph Collection, Western History Collections, University of Oklahoma, Norman. "Semi-Centennial Celebration—1957," Vertical File, Oklahoma Room, Oklahoma Department of Libraries, Oklahoma City. Linda D. Wilson, "Semicentennial of Statehood," The Encyclopedia of Oklahoma History and Culture, https://www.okhistory.org/publications/enc/entry.php?entry=SE010.